J-Net One Sided: J-NET orders that are only posted to the Participant listed as the order’s counterparty. J-Net One-sided Orders are only executed after the counterparty submits a matching J-NET One-Sided order. J-Net Cross: J-NET orders where the bid-side Participant and an ask-side Participant are set within the same order message (MO76). Both sides of the order are then executed as a cross order. Note: Currently, TT does not support J-NET combo trades. Both orders must match the same series, price and quantity. The Trading Type field must match. One order must be set to Sell order while the matching order must be set to Buy. Both counterparty Participants have set the other Participant as its Counterparty. 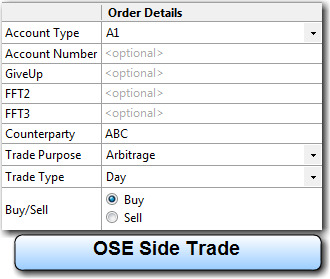 You can use the Wholesale Order window to make cross trades on OSE when connected to a OSE Gateway Version 7.17 or higher. For entering cross trades on earlier gateway versions, refer to Cross Orders. Users may enter cross trades as either a J-NET One-Sided trade which is matched to an order submitted by a counterparty or, as a standalone J-NET Cross trade where the user enters both sides of the trade. 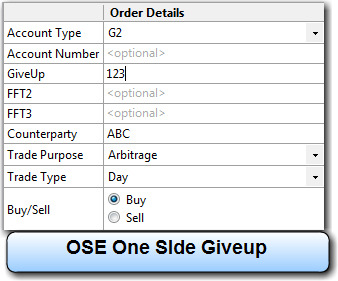 To enter a J-NET One-Sided cross trade, select One Side in the Order Type pane and complete the fields as listed below. You must verify that the counterparty enters a matching J-NET One-Sided trade. 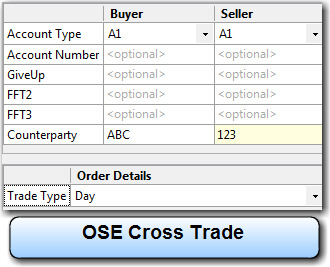 To enter both sides of a J-NET Cross trade, select Cross in the Order Type pane. When submitting a J-NET Cross trade, the user must populate the Buyer and Seller sides of the trade. Prior to submitting a J-NET trade, you should know the Counterparty’s Participant Code and the trade purpose (e.g., Arbitrage, Combination, etc). Select either One Sided in the Order Types pane or Cross if submitting a cross order with another participant. Also, set the quantity and price for the trade. In the Order Details section, complete the remaining fields as listed below. You may optionally provide a user Account Number in this field. This value is forwarded to the exchange API in the ex_client_s field. Note: The exchange does not allow the * and % characters to be used as part of the account number. Sets the type of account the trade that will be used to submit the trade. This value is forwarded to the exchange API as part of exchange_info_s field. Users may configure custom account code mappings for all trades, including One Sided trades, in the hostinfo.cfg file. The list at the right shows the default mapping for OSE Gateways 7.16 and higher. If submitting a Giveup, the user must populate FFT3 with the Customer Identification Number. Sets the five-digit Carrying Participant Code provided by the securities code committee. This field is mandatory when submitting a Giveup order and is forwarded to the exchange API as part of ex_customer_s field. Sets the customer specific information. This field is optional and can be used for back office reconciliation. This value, if present, is forwarded to the exchange API in the exchange_info_s field. Sets the Customer Identification Number. This field is mandatory when submitting a Giveup order and forwarded to the exchange API as part of customer_info_s field. Sets the Counterparty Participant Code and is mandatory for all One Sided trades. Sets the intention of the trade. Refer to the exchange’s documentation on the requirements for reporting the trade purpose. Note: Select Cross Trade to enter a J-NET One-Sided cross trade. This will require the counterparty to submit a matching trade. To enter a J-NET Cross trade, select Cross in the Order Type pane and populate credentials for both the Buyer and Seller sides of the trade. Sets the trading session which the order applies. Select VWAP (volume-weighted average price) to apply the trade across both trading sessions.